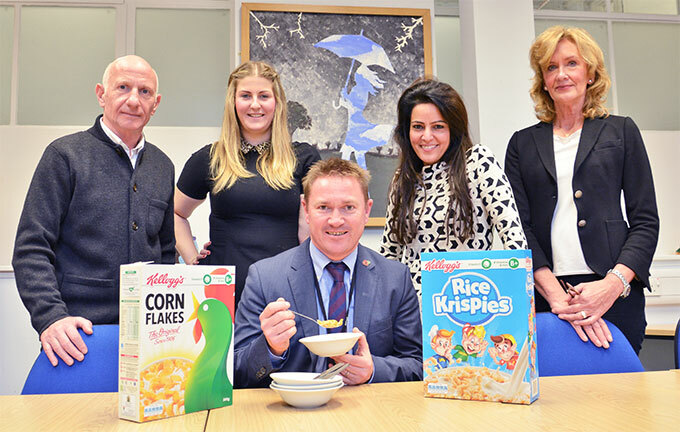 Throughout October, children in six of Derby’s schools started to regularly eat breakfast, for perhaps the first time in years, thanks to an initiative instigated by Derby City Council and leading city entrepreneur, Kavita Oberoi OBE. School breakfasts for this academic year have been solely funded by donations from Kavita, managing director of Oberoi Consulting, and Aaron Thalmann and Mike Copestake, directors of Copemann Ashby Ltd.
Kavita is leading the fundraising so it can continue next year, and possibly expand to include fruit and bread. Costs are low because His Church, a charity, redistributes cereal manufacturers’ surplus stock to schools; so far, deliveries to Derby have come from Kellogg’s. "A bowl of cereal for one child, every day of the school year, costs just £15.60. “Imagine what would happen if children’s ability to learn improves because their bodies are properly fueled in the morning. I believe the knock-on effects will be seen in exam results, and the emerging workforce employers will interview in years to come. “It costs so little to ensure a child has breakfast every school day. I implore other businesses to support this so it can be sustained beyond the first year. Imagine the children’s faces if business donations fund breakfasts for a period and then stop,” said Kavita. The scheme follows two years of persistent work by Cllr Sarah Russell, Cabinet member for education and skills, her team at Derby City Council, and Kavita, who first heard about the project at a Derby Renaissance Board members’ meeting. The board works with the council to support economic development across the city. Councillor Sarah Russell says, “I am passionate about the future of our children in Derby. Enabling them to receive the best education possible is a key priority for myself, as Cabinet Member, and for this administration. “65% of the 1,000 children in our school receive Pupil Premium, which means the government considers their households to be below the income threshold. All students need breakfast, though sometimes they don’t take it at home. “We started the breakfast scheme in mid-October. Within a few weeks the uptake rose in each year. "In the primary school, in the first week, around 30 children had breakfast with us each day, two weeks in, we have 50 – that’s a quarter of our primary school children. If school staff noticed a child skipping lunch, the school would investigate from a safeguarding point of view, as it might signpost care issues. The predominant short-term effects of eating breakfast are improvements in memory and a reduction in errors in tasks that require attention. “In the long term, we expect the breakfasts to improve pupils’ punctuality, and provide more energy so children engage and concentrate for longer, which will ultimately improve their behaviour,” added Neil Wilkinson. “We’re making the most of the opportunity to extend the children’s education through play and the environment in which they eat. "For example, we lay out board games during the primary school breakfasts, and the reception year eat in the Maths Club area. “In addition to the physiological benefits of breakfast, older children make the most of the opportunity to socialise with their peers, and even our staff. This can only be a good thing,” concluded Neil. Other schools taking part in the scheme are Derwent Community School, Springfield Primary School, St John Fisher RC Primary School, Ashcroft Primary School and First Estate School.